Asthma can be a serious condition that causes long-term suffering and some frightening moments for those who deal with it. It is defined as a chronic inflammation of the lungs, specifically, of the bronchi. Those who have asthma might have symptoms that range from severe to mild, or they might not have symptoms on a regular basis at all. Asthma is triggered by a variety of environmental factors and situations. Exercise is a very common reason why some people have an asthma attack. This is often known as exercise induced asthma, or the more technical name, an exercise induced bronchospasm. This kind of asthma is triggered by any sort of physical exertion, usually exercise. It is quite common; in fact, up to 90 percent of all of those who have asthma will also it. Those who are in their teenage years, as well as those who are young adults, might find that exercise is the most common trigger of an asthma attack. The good news is that proper medications and treatments can help those with asthma perform just as well as their peers when it comes to physical exercises. 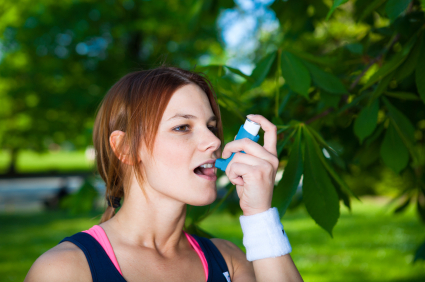 Much of exercise induced asthma can be attributed to the way we breathe during exercise. During normal breathing, the air moves through the nasal passages, which warms the air and gives it some moisture. But when you exercise, you breathe through your mouth, which means you are inhaling dry air that might be cooler than what you would breathe in through the nose. This cool, dry air irritates the very sensitive muscle bands around the airways. The result is a tightening of the chest, wheezing, coughing and other signs that are associated with an oncoming asthma attack. Coughing is usually the first sign of exercise induced asthma, and for some people, it might be the only symptom. This usually begins during exercise but actually becomes worse right after you slow down and stop exercising. If you are patient, the symptoms can resolve within 30 minutes after exercise; however, sometimes there is a “late phase” asthma reaction, which means you might have symptoms four to twelve hours after you have exercised. Though these symptoms are less severe than those that begin during exercise, they take much longer – up to 24 hours – to go away. Exercise induced asthma might make you tempted to avoid physical activity, but that causes harm to your body in the long run.You definitely need to exercise like anyone else, but you don’t want to have the symptoms of asthma, or a full-blown asthma attack – so, what can you do? The best plan is to prevent and manage your symptoms. There are many medications that can help control your asthma symptoms. When you have exercise induced asthma, it often makes sense to take medications on a long-term basis for control, as well as medications that you take right before exercise. Pre-exercise medications. These medications are designed to be taken within a certain amount of time before you begin exercise. Ask your doctor about the proper timing. These are inhaled drugs that can be used for brief periods of time; however, longer uses can build up a tolerance. The most common of these drugs are albuterol, levalbuterol and pirbuterol. This inhaled medication has been proven to help some people, while others don’t seem to react well to it. If you do test this out, be prepared for some symptoms if you are one of the unlucky ones who don't react to the drug. Long-term control medications. These medications are designed to be taken on a regular basis, usually once a day. They help keep asthma under control at all times, not just when you are exercising – though they do help you avoid exercise induced asthma. These are some of the most common inhaled drugs for asthma, and include fluticasone, mometasone, budesonide and beclomethasone. You must take the drug for at least two to four weeks before the maximum benefits kick in. These inhalers include a combination of corticosteroids and long-acting beta agonists. Though these are meant for long-term control, your doctor might advise you to take the daily dose before you exercise. These oral medications block inflammation in the body, and can be used on a daily basis. If they are used for exercise induced asthma, they must be taken about two hours in advance of activity. When you are ready to exercise, make sure your body is, too. Warming up with walking, stretching, flexibility exercises or other light activity that gets your muscles awake and your heartbeat up can be very helpful. Do warming up for at least five to ten minutes before vigorous exercise. There are other ways to help prevent or reduce exercise induced asthma. These include wearing a face mask or scarf while exercising in the cold weather, breathing through your nose as much as possible, working out in a warm place, restricting exercise when you are sick with a cold or the flu, limiting exercise during days of high pollen count or high air pollution, etc. What Types of Exercises Are Best for People with Exercise Induced Asthma? With proper treatment, most people can engage in the majority of sports available. However, there are some that are definitely more suitable than others for those with exercise induced asthma. Swimming is considered an optimum sport, since it happens in a warm, moist environment that is unlikely to trigger reactions. Other sports include those that entail short bursts of energy, such as basketball, volleyball or baseball. Sports to avoid include those that are done mostly in cold weather, such as ice hockey or ice skating. It might also be a good idea to avoid very aerobic sports, such as soccer or distance running. How Is Pain in Chest after Pneumonia Treated?